Usually we're assisting Dominion of Bedford (Chrysler/Dodge/Jeep/Ram) with standard dealership and vehicle promotions. 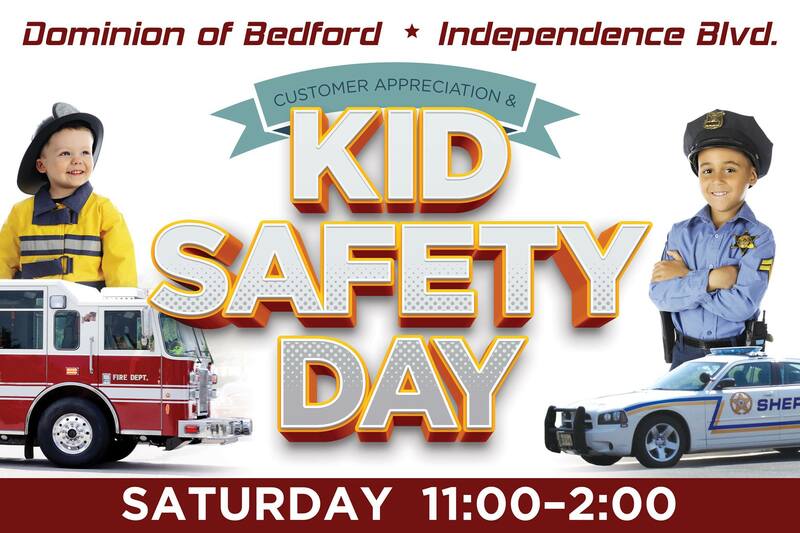 But this month, the management and staff at Dominion are planning a Customer Appreciation Day with a child-safety theme on June 30th that's more about serving the community than selling cars. The event organizers at Dominion have planned a fun day when anyone in the community can drop by and enjoy free hot dogs, drinks, chips, and snow cones — plus door prizes, special offers, and free multi-point vehicle inspections by Dominion technicians. A big part of the event is child safety. Families with kids will want to come in for free child ID cards prepared by Bedford County Sheriff's department, and thanks to support from Bedford Memorial Hospital and the Town of Bedford Police Department, a limited quantity of free bike helmets will be available for some of the first kids to arrive. There will even be real police and rescue vehicles for kids to explore...not to mention face painting. Dominion staffers have done all the coordination & "heavy lifting" for the event; Blair Marketing stepped in to help with event graphics, signage, and media support. 11:00 – 2:00 at Dominion of Bedford, 1750 Independence Blvd., just 15 minutes from Forest.